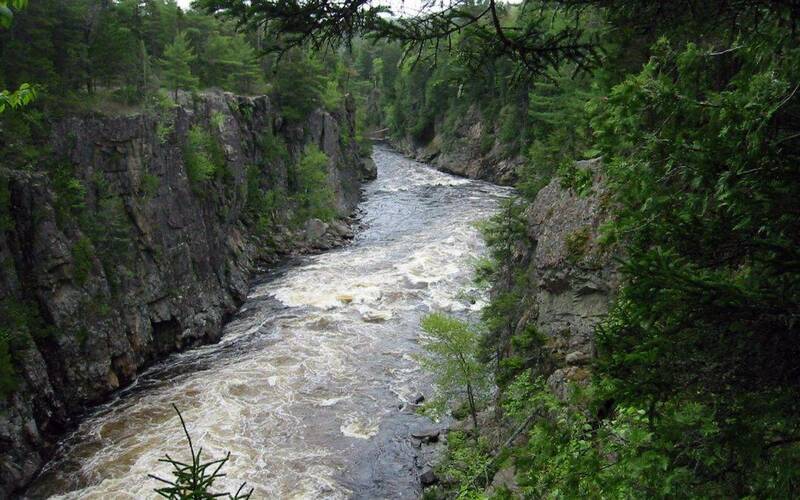 Just a short hop, skip and jump above Bangor (exit 244 off I-95) is the Baxter State Park Region, home to the mighty West Branch of the Penobscot River. 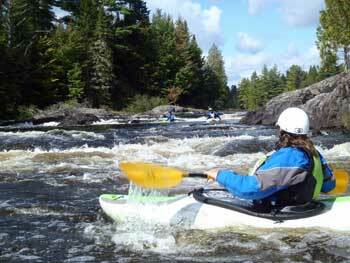 The Penobscot River is known as a drop pool river, providing a series of pour-overs and drops interspersed with calm – ideal for all skill levels of whitewater kayaking. It is a low volume river with summer flows ranging, on average, from 1,800 to 2,400 cfs. Early spring, floods, and other high releases can be dangerous but can provide for some exciting paddling at between 3,000 and 4,000ish cfs. One of the great advantages of the Penobscot River is that it is dam controlled, guaranteeing great whitewater regardless of the season. 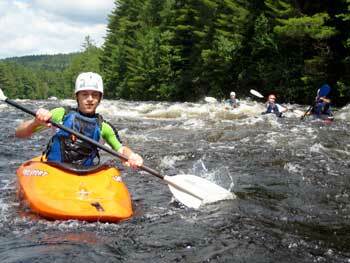 Another great advantage of the Penobscot River is its accessibility. Generally, the Golden Road follows every turn and meander of the river, providing opportunities for scouting, park and play, easy access, and selectively choosing your run. 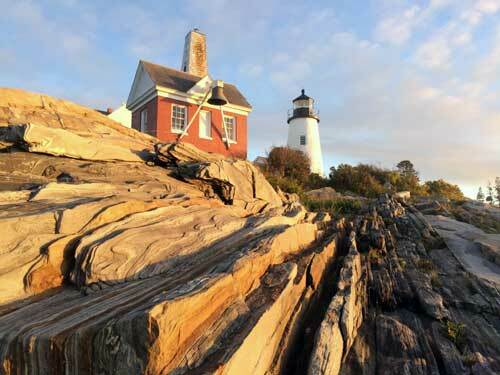 And to top it all off, the Penobscot provides a wide range of rapid classifications – making it an ideal paddling destination for beginner boaters looking to beef up their skills, practice their roll, and take a class II run; as well as for advanced boaters looking to throw ends, boof rocks and wave wheel into the class IV Exterminator. So, where do you go and how do you get there? I’ve provided a smattering of some of the best holes and runs on the river for every skill level. Starting with the basics-for beginner boaters, the stretch from Big Eddy to Big A is a great class II run. Take the Golden Road north to Chewonki’s Big Eddy Campground; be sure to stop in for a sandwich at Abol Store. There’s a boat launch, river right, just before the campground. You launch in the little eddy and immediately ferry to the center of the river to a casual rip. Warm up your eddy turning skills by working your way river left and catching your first eddy just below the rips, beyond the last campsite. 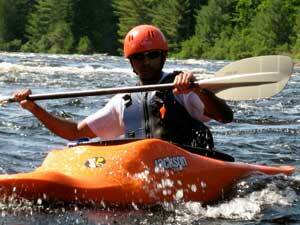 After warming up with a few c-turns, you may exit and paddle downstream. Be aware – there is the potential to come across a few fly fishermen on river right – please be courteous and conscientious. There are a few other eddies as you progress downstream and once you get down to the top of Little Amberjackamockomous, you’ll want to catch a river left eddy, next to some flat picnic rocks to scout your run. The is a pretty beginner-friendly run – with a nice glassy front surfing wave at the top on river left that you can easily scout from the rocks. Just below there is a river wide ledge – at the center is an excellent flat spinning hole. Take out is river right – just above Big Amberjackamockomous. Taking it to the next level, you have third drop of Big A. Access to this fast, dynamic play spot is best gained by running the three drops of Big A. Access to the top of this run is at the take-out of the Big Eddy to Big A run. You can get there via the Golden Road where you’ll see a small parking area, river right, usually with a large convoy of rafting buses. Put in at the top of Big A and ferry out to river center. As you are approaching the first drop, stay hard river right, boofing the first drop into a nice easy pool. Try to stay out of river center first drop or you’ll find yourself in the Big A hole. After the first drop, head immediately river left plunging into the large hydraulic known as second drop. Catch the eddy river left immediately after the drop to quickly glance downstream at third drop. Stay river left and ferry quickly out and prepare for the boof into Toilet Bowl Eddy to set up and surf third drop. Third drop is a dynamic wave hole that varies in intensity and style at different water levels. Play there hard and play the re often to know what levels you huck the best. Take out river right, just below the third drop. And finally, a quick Gorge, Crib run. Not for the faint of heart, you must be a skilled class IV-V boater for this intense thrill ride. Follow the Golden Road to the top of McKay station hill; parking is on the left just before the gate. Put in is behind McKay station at the bottom of the dryway. Put in and fight your way past the discharge from the station out into the main current. Enter the throat of Ripogenous Gorge and start working your way river right into the foaming, gaping, pounding hydraulic known as Exterminator. Ferry out and stay hard river right along the eddy lines and be looking for the crashing curl – hitting it perfectly will send you to Nirvana – missing it is like drinking 10 cups of coffee and throwing yourself down a flight of stairs (thanks, Nate Ostis). There’s so much more to this run but we’ll move on to the class V Cribworks and let you discover the magic of the Gorge on your own. After playing around in some nice class II-III whitewater below the Gorge, you’ll hit a 90-degree bend in the river known as Steve McQueen corner. If you want to scout, head river left – Vulture Rock is a common vantage point. Otherwise, enter First Chute, river left, catching Pillow Eddy to the left just after the drop – beware of Pain in the A** rock. Pillow Eddy is a great vantage point to view the rest of the rapid. You can exit this eddy and head straight down to Final Chute, river right, or stop and play in some of the fun river features the Cribworks has to offer. Make sure you try the boof move on river right, it’s a hoot. The island smack dab in the middle of the Crib is a great place to get out and watch the show or run Final Chute over and over. Head down to the take out at Big Eddy campground. Top off the day with a warm fire and a cold beer at a riverside campsite at the Big Eddy. No matter what section of the river you run, the Penobscot River offers some world class whitewater topped off with a spectacular view, good hiking, great fishing, and phenomenal people.